A who’s who of the region’s MICE, events and entertainment industry gathered on Wednesday night at the Armani Hotel in Dubai’s Burj Khalifa for an evening of networking in a social setting. The first in a series of networking events organised by those behind the Middle East Event Show, it was a great way to connect with potential clients, meet new suppliers and network with fellow industry professionals in an informal atmosphere, according to those that attended. The night is planned to run every second month, with this next event to be held in January. Scheduled from June 1 to 2, 2011, the Middle East Event Show has gained considerable support and acknowledgement from the industry and is poised to become the launch pad for international suppliers, venues as well as show organisers to venture into the booming Middle East events industry. 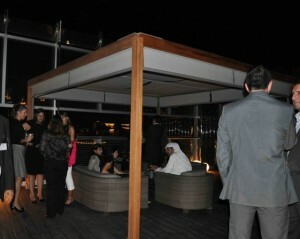 Previous articleDubai Armani Hotel’s Mediterranean restaurant delicious food buffet.